Discover the ancient history of the Clan Macdonald in the Hebrides with a tour of Clan Donald lands on the Isle of Skye. Visit Armadale Castle and the Museum of the Isles which details the history of the Macdonalds over the centuries. On the southern tip of the Sleat peninsula on the Isle of Skye, in the grounds of the ruined Armadale Castle, lies the Museum of the Isles. Discover more about the Norse/Gaelic roots of the Macdonalds and the powerful Lordship of the Isles with Clan Donald at its helm. Explore how this sea kingdom - based around the Hebrides - became one of the most powerful forces, not only the Highlands, but also in Scotland during 14th and 15th centuries. The Clan Macdonald tour to the Isle of Skye begins at Inverness where we follow the banks of Loch Ness down past Urquhart Castle to Invermoriston before turning west through Glen Moriston on the way to Loch Cluanie and Glen Shiel. Loch Duich awaits us at the foot of the Five Sisters of Kintail mountains with the stunning Eilean Donan Castle in the distance. After a brief photo and refreshment break at the castle we cross the bridge we cross the bridge to the Isle of Skye where the spectacular Cuillin mountains greet us in the distance. We then make our way down the Sleat Peninsula towards the Clan Donald Centre where we have around two hours to explore the centre. 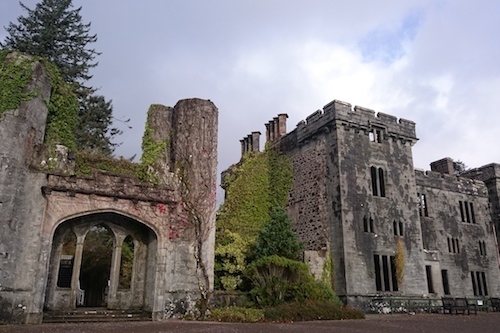 As well as enjoying the wonderful Museum of the Isles (which tells the history of the Macdonalds over the centuries) there are beautiful gardens to explore along with the ruins of Armadale Castle, the ancestral home of the Macdonalds of Sleat. Leaving Armadale we spend the rest of the afternoon getting off the beaten path and exploring the remote western side of the Sleat Peninsula for a tour of ancient Clan Donald lands and some great views across to the Cuillin mountains before we begin our journey back to Inverness. The tour covers approx. 220 miles over 10 hours which allows for lots of stops and time out of the vehicle enjoying the scenery. We have 1 long stop on the tour for 2 hours at Armadale Castle and the Museum of the Isles. We also have a shorter coffee stop at Eilean Donan Castle for 45 minutes. Additionally, we have at least 8 viewpoint and photo stops between 10 and 15 minutes. Tours in March and November are only available on weekdays. Tours are exclusively for your private group only (up to 3 persons) and prices are per tour. We only offer private tours and do not combine individuals or separate groups - if your group size is less than 3 the advertised tour price still applies. Prices include all taxes and a driver/guide but exclude entrance fees and meals. Interested in Multi Day Clan Macdonald Tour? If you would like a longer tour then consider the 3 Day Clan Macdonald Tour which includes the Isle of Skye and Armadale Castle along with Clan Macdonald lands in the Highlands or the 5 Day Clan Macdonald "Lord of the Isles" Tour that also includes the Isle of Islay. ...and because it's the Highlands and we can have "four seasons in one day"!